Making a journey is always about going from where we are now to another place—a higher realm of consciousness. Iona is known as Scotland’s sacred isle, labeled iishona, meaning blessed isle. 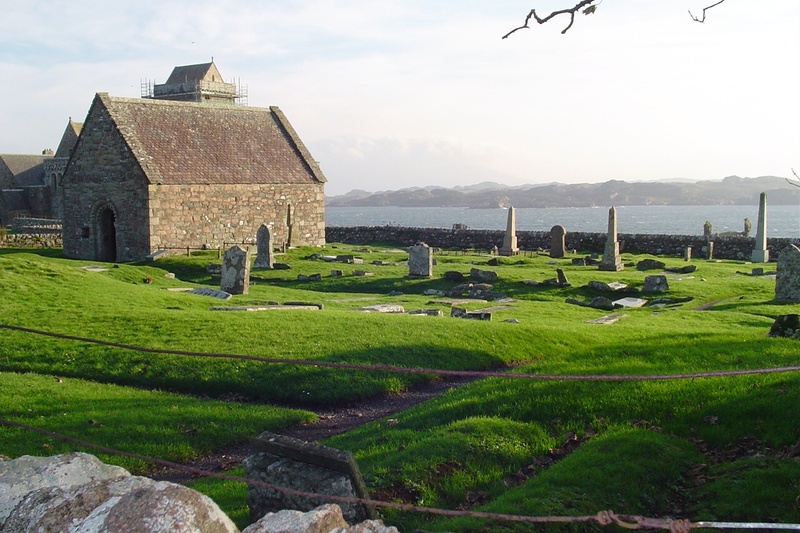 The fact that the wise Druids and no less than 30 great Scottish chieftains were laid to rest on Iona attests to the sense of holiness of the place. That is why for hundreds of years people have made a pilgrimage to the island, curious about its extraordinary powers that seem to leave no one untouched. Perhaps it is because of the unique geographical formations dating back hundreds of years, as well as the energy spots that seem to create a thin veil between oneself and the supernatural. Whatever the reason, those called to Iona leave changed. And “called” you must be. Who else would take such an arduous trip—a flight across the Atlantic, train ride to a seaport town, ferry to the Isle of Mull, bus across Mull, and finally the ferry to Iona. But once there, a woman can find sanctuary in every corner of this empty, yet wild place. So it always is for me each year, when I seek another dose of inner peace and have the desire to re-ignite my wilting spirit. “For people over thirty,” Carl Jung said, “all problems are spiritual rather than psychological.” Each time I take a stab at individuation, I realize that I don’t quite know what I’m looking for– just that I am looking for something. But retreating close to home can bring the same serenity for an earnest seeker. The artist, Andrew Wyeth knew this when he settled in Brandywine, Pennsylvania. It simply was his place. He believed that everything he would ever want to capture on canvas could be found within a four-mile radius. May you take some small inspiration from my tales and pictures of Iona and then find your blessed isle closer to your home. Have you been wondering who you are beyond the roles that you play, looking for a new direction, contemplating a change. If you have asked such questions you are being given a wake-up call to devote some time for yourself. There are 8700 hours in the year…isn’t it time you found a few just for you? To begin your quest, list what is outlived in your life– roles, ideals, people, In doing so you can begin to make room in order to embrace what is unlived. This entry was posted in Online Retreat by admin. Bookmark the permalink. Joan, as soon as my sister introduced me to one of your books, I had to have them all. I have been thrust into a new role of unemployment & caretaker having moved back to my hometown, which I didnt want to really do, but have none the less. I too, like some other bloggers have mentioned, feel like I lost so much when I divorced, the familiarity, being part of another family & community. It is especially fresh since coming back to my hometown. I know that this time is a gift. I know that I am on a journey but it is so hard right now. Thought I was through this when I went thru the empty nest trying to figure out who I was. Now I find I am there again, trying to figure out who I am & what I want to be when I grow up. sorry to be a downer this morning… but does anyone else feel this way? I hardly ever say yes anymore without a pause…I want time for me and not duty time but being time…you are not a downer but a believer in feminine energy…we can’t possess such warm vitality unless we nourish ourselves…and gift ourselves with a massage, a long walk, a flower, even one of my retreats. It seems that life is a constant state of adaptation. I know we woman are constantly adapting, to the demands of home, children, husbands, family, jobs…you name it. The “demands” on me have not been as monumental as some of the ladies here mention, but in all of it I’m working to remember who I was before all of this. I don’t look 18 when I look in the mirror, but my heart still feels the same. This retreat will keep me focused through all the “stuff of life.” It’s so good to be hearing how the hearts of others beat. yes we are not 18 or 28 or 58 but we are layered with experience, heartfelt moments, special people and not so special people and we are each unique, maybe more so than others who are not asking the questions and attempting to re-invent ourselves. I read somewhere that you can see if a woman has congealed or not…that being stopped her growth. The women here on line are surely unfinished and exciting because of it. “Faith is taking the first step, even when you don’t see the whole staircase”. – Martin Luther King,Jr. the challenge is…how long can I let the time alone last in my real life…how often can I tap into my own needs first before leaping into the fray? I’m home from a business/vacation to one of my islands, Maui. On the way home I continued to reread A Weekend to Change Your Life, all with good intentions. Once home, the lawnmower’s not working, a tenant is not paying rent, a child (make that two) is needing emotional help, and an aging mother-in-law is yanking at my pshche. I sound ungrateful and just mean-spirited. But I want ME in my life for just a little longer than it takes to take a shower in the morning. I continue to work on it. Husband is back at work today, which helps because the house is quiet, but he’s retiring soon. As Mary Poppins observed, the winds are changing…again. I am determined to prevail and find my calling in this next phase of my life. joy is a duty and peace is your heart and soul from time to time is the only medicine you can give yourself to stay the course. Glad you’ve joined me on line as we all struggle with the demands and needs of otheres without taking care of self first. Hang on to the bliss of Maui…you went there not just for vacation but to vacate and become an empty vessel to be filled with spiritual energy…keep it look at a picture from your beach and let the air blow through your life once again. This “online” retreat is such a gift, Joan. My days lumber by almost like a train being pulled against it’s will. This innovative retreat has stopped the train and allowed me to get off. I found a beautiful journal notebook and am thrilled to be writing, sketching, thinking and praying about the next road I will be walking (or crawling!!). I have no definitives yet,….just HOPE. From Kripalu I took away a stone with just that word painted upon it’s smooth and strong surface. I love the buffeting air, wind and bagpipes from your Iona time. Though not in Iona, I feel the draw to go inside, both literally and figuratively at this time of year. Thank you again and again. thank you for loving my contribution to this new technology Believe me I didn’t get it until I did it and now it is opening up a new set of friends, sisters, and retreaters. Why not consider starting a group of seeking unfinished women and magnifying our desire for truth and growth? I have been starting a journey without realizing it for the last year as I have begun to yearn for something “more” than the roles that I have allowed to be placed on me. I recently attended a medical conference where I was lucky to be able to be part of a community ritual for healing which encouraged and allowed me to let go and release many feelings that have held me back over they years. It was asked what did I need to let go of or release in order to increase the balance and wholeness of my life? Such an emotional ceremony in the spiritual location of New Mexico and now that I have let go of so much resentment and anger it is time to get back to the woman that I am meant to be. Taking time for myself is a new and difficult task but one that I embrace. The New Mexico trip was the first time in the last 25 years that I went anywhere alone, no husband or children and it was very intimidating but how wonderful to be with myself and hear my spirit that is so often ignored with the everyday life of raising a family and working. I am glad to finally listen and to take the time to get back to the girl I was before and hope that by doing this can teach my children the importance of caring for themselves, to not let go of their passion and listen to their spirit. I work the night shift and have recently started to take morning walks before heading home, heading to the beach to listen to the water or to the park to listen to the trees and nature before heading home. I have noticed that my sleep is better during these days as these walks help me release the stress of the night. Listening to the sounds of nature in my daily meditation helps me hear my voice, my dreams and my spirit. “Every step is a prayer, every breath a thanksgiving” Native American quote. Thank you for sharing. Your words spoke to me and encouraged me. I need to let go of alot of resentment. Just wanted to let you know that your sharing was appreciated. Thank you Joan for a lovely posting. I am sorry that I have not been able to join you at Iona. I can relate to Susan’s comments about searching and moving, searching and moving. Finally I realized that every time I moved, I took myself along. I need to be still and quiet and find me where I am. Now I am considering another move, back to the Midwest and “home”. No longer lonely, but content with myself. But I wouldn’t be who I am without all of the searching and moving, so I am grateful for it all. I love your pictures, especially the boats. I love pictures of small boats on the beach. Thank you again for all that you share with us. So important to live where you feel a sense of place because it is safe and warm and you can feel your ancestors there. I recently walked a labyrinth and got to the center where I heard the word, Let Go. I walked out in tears and then found myself lost on the way to finding a Native American Medicine Wheel. Eventually, I found it and realized that the wheel was all about calling on one’s ancestors. What a relief when I realized that we are never alone and we can call on our relatives to hold us up forever. Bon Voyage as you move toward a place where there will be a holding pattern. and you a gift to me…your smile, your guts, your ability to risk and change! You are an inspiration as wew all can be for one another if we share and tell our truth. Joan, this is such a blessing, I am sitting here laughing and feeling such love. 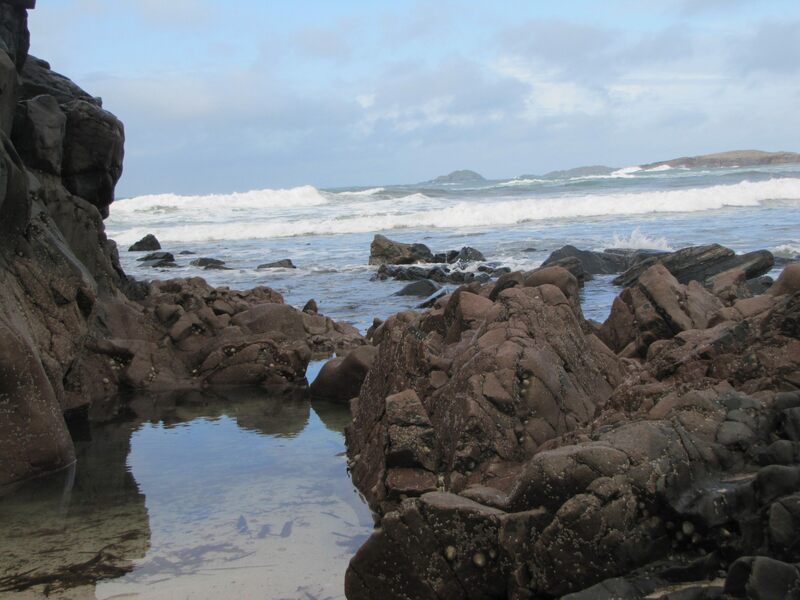 I felt Iona calling to me earlier this year.. and it was so special and sacred. I was sure I must go to Iona. Interesting how while some things changed — the symbolism never ever left me.. it was an entrance to womanhood for me.. ‘the call was coming from the Womb of the Earth’ and now SHE is coming back to me ‘right here where I am’ just a month later from that possibility. I am very much on the feminine journey with PARIS and yet so open to Going Within and finding true peace and contentment. I am in such a need for Quietude and Gifting myself with True Rest and Rhythm. This feels so right to join you in this online retreat! Much love and I thank you from my heart and soul! ~I love John O’Donohue quotes also.. they stir within me with such beauty and depth! *what synchronicity to be here tonight! I am smiling! Thank you Joan for this on-line retreat. Three years ago I picked up one of your books and my life became a whirlwind. I also left in my 1998 volvo to find myself. I must say, I am still looking. Some days I am on top of the mountain, but many others I sit and wonder where the me I knew went. After 3 moves to places that I knew no one or hardly myself, I ask what am I doing. I am in hopes that the “me” I am looking for is right around the corner. I am 52 years old still lost and much of the time lonely. Any suggestions? Thank you for your beautiful words that you offer to all us women. I am no longer married. My relationship with my ex began at 16 years old and until I was 50. I knew all the steps of my next day. When I moved on I lost family and friends because of the decision. As I wander around now I miss knowing the steps of familiar grounds. It is painful, but for some unknown reason it is my path of life for now. Thank you for your comments. Susan, I had a similar situation; married at 17 to my high school sweetheart – divorced after 24 years. I was completely and totally “lost” and hurting. I used to get in my car and just drive. I moved. I tried going back to school. I had several different jobs. The quest for happiness in my new single (spelled a-l-o-n-e) life seemed endless. Slowly, over time I grew. I got help along the way from friends and family and good counseling. I began to relish my life on my own terms. Today, I couldn’t be happier with how I’ve evolved and look back on the pain as a “growing” pain. If you love and trust yourself and listen to your inner voice you will head in the right direction. You’ll see! Thank you Terry for your kind and supporting words. Even though they cause tears, I know in my heart I will grow. It is nice to know others have felt the inner pain that sometimes is a silent killer. I am blessed to have this support on line. Thank you again. Thank you for sharing your path, gives me hope for journey! Terry How wonderful of you to share your truth. Look how many women you have already helped! Erik and Joan Erikson believed that by going through and facing adversity and conflict we gain certain strengths…there is no other way (unfortunately)…but oh my the lessons and the growth that occurs.There is no way around pain…I feel it deeply with my son’s pending divorce–and yet I now have a greater grasp on what it means to suffer and feel powerless and therefore have a better connection to my fellow seeking sisters. The truth will set us all free. Thank You for contributing. I married the boy across the street at 19 and divorced him 37 years and three children later. When I made that decision it uprooted all that I had known….like you friends were gone and all that had grown familiar. Seven years have passed since I moved to another state – my children still have not forgiven me for “leaving.” In that time, I have found much I did not know about being alone and taking care of myself – oh yes, I have mistakes and messes along the way. I did not understand how much grief I have been carrying with me until I took the time at Cape Cod in May – no idea! Never did I imagine being alone at this time in my life, never! It was supposed to be with the man I married enjoying our children and grandchildren. As you commented, for some reason this is the path we are now traveling. If at any time I can share and give you support let me know. I am here! Susan You are truly on a 2nd journey…change was thrust upon you, you had a crisis of feelings, you were stopping and now you are alone…but alone takes you to a place of being all one..knowing yourself like you’ve never known her before. The phases of womanhoood you’ve experienced, the adversities you have gone through, as painful and uncomfortable, have made you unique. One day you will take your special life experience and begin to make a difference with it. That is what a second journey is about..when you emerge out of the wilderness you are new, fresh, and as such empowered. I have 3 days by myself– my husband is at a cigar smoking convention!!!! So I plan to enjoy “my” time with visiting your blogging retreat!!! It is so very special and I treasure your insights greatly. I miss you so this is a wonderful way to listen to your words of wisdom. Thank you for giving up your quiet time to listen and talk to your salty sisters! Maybe we should have a reunion! Wouldn’t that be the best day! May your days be filled with calm and personal fulfillment. For the past five days I have taken time for just me. I have walked, biked, ran or just sat in the stillness of the fall sunshine. The solitude is renewing. I enjoy letting my mind and soul fill with the sounds of nature and the smells of fall. Searching deep inside gaining comfort from within…..
good for you when I had this idea I didn’t realize how important it was for even me to stop, pause, and breathe. Thanks for “selling” the idea to your other fellow retreateers. My commitment to RE-TREAT quickly lead to insights, thoughts, ideas–and, in just a few days! I look forward to discovering my own soothing spaces. And, I celebrate what Joan discovered in Iona. It seems there are places we link to deep in our DNA. Cape Cod called me. Sedona has saved me more times than I can count. And, I have an overp0wering urge to visit the little alp in Switzerland where my ancestors lived. As Joan described in her book–I want to find my grandmother’s face amongst the women praying the rosary in the local church and see my father’s face coming toward me on the street. Joan, I send my gratitude for this delightful week. Especially loved the Carl Jung quote in today’s blog. If we all took just 15 minutes a day with only natural sounds and alone time can you imagine what new life we could breaths into ourselves. Sounds like you are doing just that Lisa. RE_TREAT is the way for caring, nurturing, compassionate women. I love the video. Hearing the bagpipes, seeing the chapel and even hearing the wind blowing carried me to Iona this evening after a difficult afternoon and evening. Indeed the journey to Iona is not easy but the rewards are many. What a pleasure to see the beginnings of this “online retreat”…..it is just what the doctor ordered!! I have had the pleasure of attending one of Joan’s retreats on Cape Cod, and have had the distinct honor of sharing the Iona Retreat with 28 other incredible women. As we trekked across the island, going in the different directions to gain the character and qualities of each direction, it occurred to me that we were all at some type of crossroad in our lives. As we walked in rain and sun, calm and blustery days, we each garnered what was necessary for us to continue our own travels once we went home. I looked upon a crossroad as making a decision and going forward with a hopeful heart that it was the right choice. What I realize now, from Iona and my own individual moments with my own journal, is that in walking the island, I acquired a miriad of qualities that I was unaware of at the time. In walking to the South, to get Clarity, I was open and received patience, grace and healing, all being carried on the wind from the other directions. So in making a choice, when we come to a crossroads, if the first choice is not right, we HAVE the qualities to go back to that point, and try again. We can be confident in our new resolve to make the right choices for us, for now, for the next time….thanks Joan, once again, for this timely moment. I think now I am on the right path…. Can’t wait to get to the Cape and you and Anne and I can have lunch. Take care…..
Great to hear of your continued journey! And as Jean Shinoda Bolen says: “When the heroine is at the crossroads she wants to make her decision as to which way to go by herself. The non-heroine wants the decision made for her.” Sounds like you are the heroine Bonnie! Your online retreat comes at just the right time (Is there a wrong time?) for me to renew my commitment to myself. A true blessing! You have a solemn obligation to take care of yourself because you never know when the world might need you, said Rabbi Hillel…so time spent with sself and self care is actually a sacred act. The warm sun graced this spectacular fall day, and in carving out this time for me, I resolved at the end of my journal entry to give myself permission to move forward.. I can atest to the fact that when returning from Iona…you will be a changed woman. That is exactly what happened to me. The change that came over me was an unbelievable feeling of peace. I have not be able to return to Iona. …but I am there in spirit eveytime you retreat there and I have found my blessed isle here at home. It is the right place to be when we are searching for something. It called to me and I went. I was so glad to read your comment. I believe that we need to find our own peace where ever we are. I experience inner peace very early in the morning when I put on my liquid mind CD’s, have my coffee and watch the birds gather at my window. I have never been to Iona, but I have walked the beach at the Cape and came home a different person. I hope you are well. Sylvia! I was so happy to see your comment. I remember you from Joan’s retreat @ Cape Cod in February 🙂 I will never forget your heroic story you shared with us about leaving your marriage. 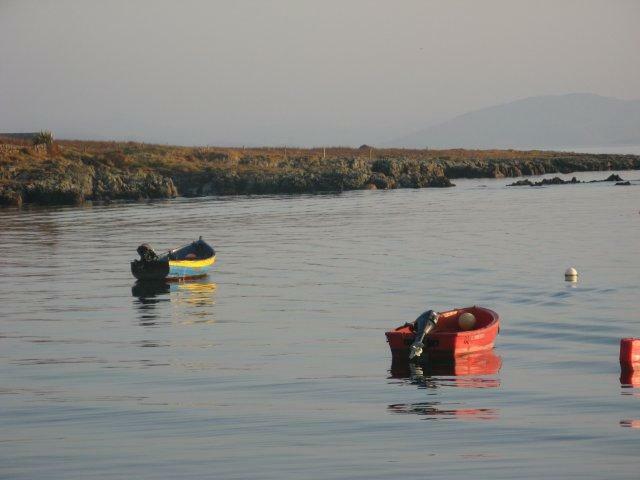 I have signed up to go to Iona in 2011 and hope I have as uplifting an experience as you did. I hope you are well ~ it would be wonderful to see you again sometime.